The results show a tight job market, improved finances and consumers’ elevated confidence to purchase big-ticket items are supporting construction. That means homebuilding probably contributed to economic growth for the second consecutive quarter. The strength in March was concentrated in multifamily construction such as apartment buildings. That category tends to be volatile; March’s advance in starts followed a 10.2 percent drop in the prior month. Permits for single-family homes were a weak spot, dropping 5.5 percent, the biggest decline in seven years, to the lowest level since September. While demand remains solid, a shortage of workers, rising costs for materials and a scarcity of ready-to-build lots are limiting gains in building activity. With borrowing costs rising, affordability is also becoming a hurdle, as property values outpace potential buyers’ income growth. Sentiment among homebuilders fell in April for a fourth straight month amid limited land availability and higher lumber prices, according to data Monday from the National Association of Home Builders/Wells Fargo. 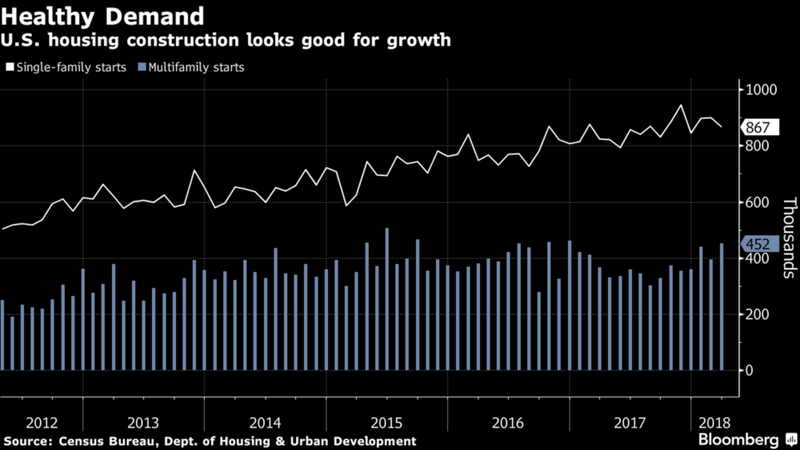 Nevertheless, sentiment remains elevated, and in an indication that builders will remain busy in coming months, the number of homes under construction at the end of March reached 1.125 million, the highest level since July 2007. Single-family dwellings under construction inched up to 504,000, the most since mid-2008. The overall strength in March housing starts is all the more encouraging given that the colder-than-average weather is likely to have curtailed gains. Fundamentals appear to support a positive outlook for the construction sector, despite labor constraints and rising material costs. Demand should also be supported by a tight labor market and steady pay gains. Newer PostWhat’s Behind L.A.’s First New Container-Based Community School for HOLA?